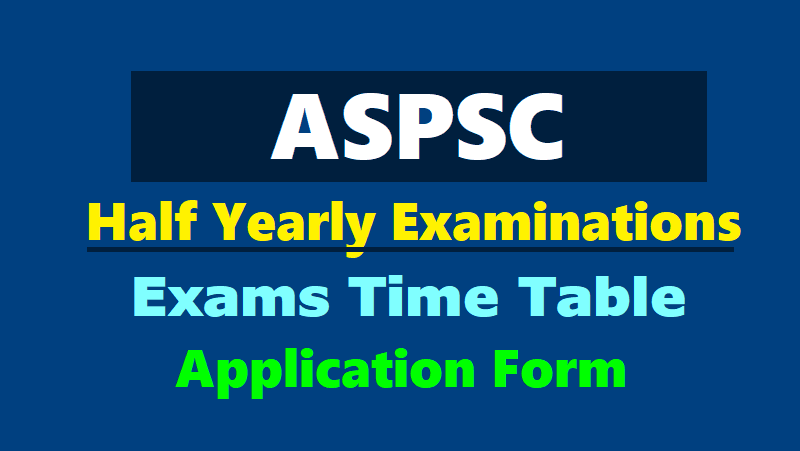 ASPSC Half Yearly Examinations March 2018 Notification: Applications are invited from Officers of the All India Services and State Services working in Andhra Pradesh State for Half Yearly Examinations, Language Tests, and other Tests scheduled to be held from 20/03/2018 to 23/03/2018. The application and other details can be downloaded from the Commission’s website: http://psc.ap.gov.in. The Half Yearly Examinations and Language Tests for Officers of the All India Services and State Services (for those who are already in Service), Proficiency Test in Telugu for All India Service Officers working in Andhra Pradesh State and Incentive Award Test in Telugu for All India Service Officers working in States other than Andhra Pradesh will be held from 20/03/2018 to 23/03/2018. Applications should be submitted in advance through the Heads of the Offices or Departments / Collectors under whom A.I.S Probationers are working, so as to reach the Commission’s Office on or before 26/02/2018. Applications received after the above mentioned date will not be entertained. In respect of the Incentive Award Test in Telugu for All India Service Officers working in States, other than Andhra Pradesh, the Applications should, however, be forwarded through the Chief Secretary of the State in which the Officers are working. Separate Application Forms for Half Yearly Examinations and Proficiency Test in Telugu for All India Service Officers working in Andhra Pradesh and for Incentive Award Test in Telugu for All India Service Officers working in States other than Andhra Pradesh shall be submitted. The application and other details can be downloaded from the Commission’s website: http://psc.ap.gov.in.